A medical grade chemical peel is one of the best things you can do to improve your complexion. Our expert aesthetician, Erin, describes the chemical peel treatment and what it can do for you. Hello, hello. I’m Erin and I am the Medical Esthetician here at Restore SD Plastic Surgery, and I am here today to talk to you about chemical peels. Chemical peels are a method of chemical exfoliation, which is going to remove the surface of your skin, also known as the stratum corneum. It’s a perfect procedure if you have pigment, melasma, hyperpigmentation, any sort of sun damage, or post inflammatory hyperpigmentation from acne or acne scarring. There is a little bit of downtime associated with this procedure. You are going to have three to four days’ worth of sheet peeling on your skin. You might be red and irritated for another two to three. All in all, I call that five to seven days of down time and it is imperative that you wear sunscreen every day, forever afterwards. 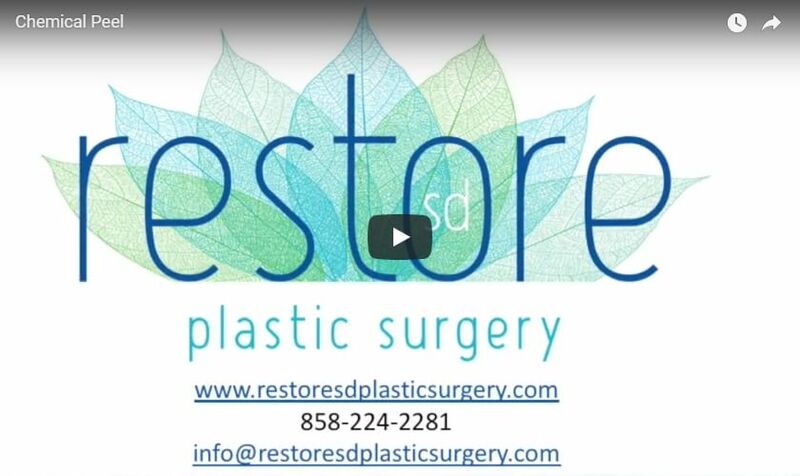 If you have any questions about chemical peels or you want to do a consultation, go ahead and call us here at Restore SD Plastic Surgery.